Founded in 1999 and running on the Realtime Gaming (RTG) software platform, Silver Sands Casino Mobile provides South African players with high quality casino games wherever they are. An easy to use platform in dark red colour allows wagering in ZAR via mobile browsers of all kinds of mobile devices on the go in a fair and secure environment. Operating under the license of the Kahnawake Gambling Commission, the casino is among the most popular gamin venues in South Africa due to attractive promotions and the stable and reliable platform it runs on. If you choose to play on the platform provided by the USA company RTG, you can be sure that you will enjoy a seamless gameplay on the go. That is the case with Silver Sands Casino Mobile which can be accessed from a variety of mobile devices with no need of downloading an application. In order to access the mobile version of the casino, you should enter the instant play version of the online gaming venue and scan the QR code on the left screen of the page which will take you directly to the mobile version of the casino. You can play the games offered in practice or real money as soon as you register your account. Silver Sands Casino Mobile as well as other RTG powered casinos offers the smooth gameplay on the user-friendly platform well-known for its stability and reliability. However, the most important aspect of gaming establishments is the way they protect sensitive data obtained from their users and if you opt for Silver Sands Casino Mobile you can be sure that all your transactions are secure which is certified by PSI DSS, a worldwide security standard of the leading credit card companies which guarantees that web shop data and credit card payments are secure. The fairness of the gameplay is evaluated by the Canadian company which verifies that the Random Number Generator use is acceptable. The mobile version of Silver Sands Casino offers a selection of mobile slots from RTG which provide you with a genuine casino gaming experience on the go. 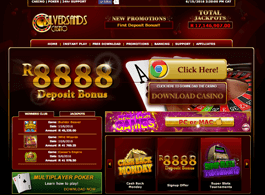 The offer is not as wide as on the desktop version, but you can still choose from a plethora of themes and types of slot machines like 3-reel, 5-reel, 6-reel and progressives. New titles are added to the library on a regular basis and you can enjoy all new releases as they are added as soon as they are launched. The RTG slot machines come with adjustable or fixed paylines and a wide betting range so that all kinds of players could enjoy this kind of entertainment. You can wager from only R0.10 up to R5 per line and even win a random progressive jackpot which is displayed on the screen. Not only that you can enjoy mobile slots, but you can also take your chance on a variety of other casino games such as classic and Suit 'Em Up Blackjack, European Roulette, Keno, Double Double Bonus ad Tri Card Poker. All the games offered by Silver Sands Casino Mobile are optimised for horizontal play and work smoothly as long as you have a stable Internet connection. Whether you are an Apple, Android, Windows Mobile or Blackberry mobile device user you can enjoy all the games provided by Silver Sands Casino Mobile on the move. If you use any of iOS powered devices, you should access the casino via your Safari browser, while users of other smartphone or tablet devices should use Google Chrome. Among the supported devices are iPhone 4S and newer, iPad 2 and newer and newer generations of smartphones and tablets powered by Android, Windows and Blackberry. All players wagering in ZAR can make use of the up to R8888 welcome bonus based on your first three deposits upon the registration. When you make your first deposit you are awarded with 100% bonus up to R1888. As soon as you make your second deposit, you can redeem a 75% bonus up to R3000 while on your third deposit you get a 50% bonus up to R4000. Visit the Silver Sands casino website to obtain all the needed information and the coupon codes you need to submit in order to get the free money. You can also request R200 no deposit bonus and enjoy all the games on the house. Besides, you can benefit from special offers aimed at those players who use certain payment options as well as from other promotions offered on a weekly or monthly basis. In order to withdraw the payouts earned by using free cash you should meet certain wagering requirements which can be found in the Terms and Conditions section of the casino. For instance, if you want to clear the funds earned from the welcome bonus you need to wager the cumulative sum of your purchase and bonus 10 times before the withdrawal. The first thing you should know when it comes to financial transactions at Silver Sands Casino Mobile is that the gaming venue guarantees that your personal information will be secure and your transactions protected. The casino accepts all online banking solutions available to South African players and MasterCard and Visa credit and debit cards are among the most popular ones. You can also make your deposits and withdrawals by using e-wallets such as Skrill, Neteller or EcoPayz. Not only that they are the fastest withdrawal methods, but you may also obtain some free cash by using some of them. Transactions via e-wallets are also free of charge, while if you opt for Bank Wire Transfers you may be charged fees and withdrawals via this method usually take longer. If you have any doubts or problems while playing at Silver Sands Casino Mobile, you can contact customer support via e-mail or toll free phone line which can be found on the website. If you want to wager in ZAR without any concerns about exchange fees, you can try out Silver Sands Casino Mobile available for practice and real money play on the go. You can also enjoy a variety of promotions letting you earn on the house while playing your favourite games. The most important thing is that all your transactions and data are secure and the gameplay is proven fair by reputable institutions taking care that everything works just as it should.